The Homemade Kotinos is a great Olympic craft for preschoolers on up! Kotinos is Greek for an olive branch intertwined to make a circle crown. It was the award given to the athletes in the ancient Olympics. If you are doing this craft with preschoolers you may want to use a paper band rather than pipe cleaners. 1. Take three pipe cleaners and twist them together to make one thick pipe cleaner. Take three more and make another. 2. Take the ends of the thick pipe cleaners and wrap them together to make a band. (Two sets of pipe cleaners twisted together will fit kids 6 and under, older children will probably need 3 sets or 9 pipe cleaners). If you are doing this craft with younger children you may want to move to step 3 and glue on your leaves on a flat surface before you make the band. 3. 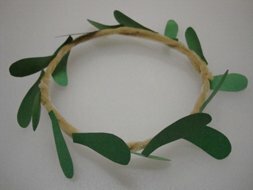 Cut green olive leaves from construction paper and glue them all around the band.